In our recent research trip we met with a range of CEOs, CFOs, operational heads and investor relations contacts at companies in London and across multiple cities in the US (San Francisco, Santa Clara, Las Vegas). On this trip we focused primarily on our technology-related businesses based in the US, leisure resorts, global pharmaceutical, European financials and small to medium cap companies listed on the London Stock Exchange. While our primary interest was on specific operational updates from our investee companies, we also widened the lens to see how the small to medium end businesses were coping with the fallout from Brexit and uncertainty in the UK and European economies. In an overall sense, our broad range of meetings (sample list below) continue to reaffirm our belief that the world is on the mend and the Technology industry is well positioned to benefit. We believe investors will be well rewarded by taking a genuine long term approach to allocating capital to the Technology sector and the Pendal Concentrated Global Equity Fund has over 20% invested in such positions. We currently own names in software, analogue circuits, semiconductor producers and associated equipment manufacturing businesses in our portfolio. Regular readers of our fund commentaries would be well aware of our views on technology so in this edition we provide a deeper insight into Intel, one such semiconductor business we hold today. In a nondescript building in Santa Clara which belies its place in history sits the global headquarters of Intel, the world’s largest semiconductor company. Intel is credited with developing the world’s first ever microprocessor chip in 1971. This microprocessor went on to become the building block that engineers could purchase and then customise with software to perform different functions in a wide variety of electric devices. The microprocessor is the central processing unit (CPU), or the ‘brain’ of a computer. In 1971 this microprocessor the size of a thumbnail was considered revolutionary in that it delivered the same computing power of the first computer built in 1946, which filled an entire room. Since then, Intel has been instrumental in developing increasingly more powerful microprocessors without increasing the size of the chip. Today, microprocessor chips power data centres, PCs, smartphones and a myriad of other electronic devices that we use in our daily lives. Microprocessors are now being designed for a wide range of specific applications. Chips simply roll off the production line, right? Designing and manufacturing the ‘brain’ of the computer is actually an intricate, time consuming and expensive task and becoming increasingly so. Consumer demand for automated driving, connected home devices, robotics and virtual reality capabilities among other things require significantly more chip ‘brain’ power. While they appear to be flat, chips are actually three-dimensional structures and may include as many of 30 layers of complex circuitry. The design and manufacture of a chip can typically take around five years. Clearly, the business of producing microprocessors is anything but simple. Chips are made by creating tiny patterns on a polished 12 inch silicon disk (wafer) using a process called photolithography and depositing very fine layers of material on top. The wafer itself is a thin slice of semiconductor material (silicon). The most sophisticated processor can contain millions (or billions) of transistors interconnected by fine wires made of copper. Each of these transistors act like neurons in the brain controlling the flow of electricity through the chip to send, receive and process information. After typically more than 2000 steps of lithography, etching and material application, the wafers are transformed into microprocessors. Each is then cut into many thumbnail sized ‘dies’, which are individually placed in a ceramic enclosure. The ceramic package protects the die and delivers power and electrical connections when placed directly into a computer circuit board or mobile device. By comparison, it takes longer to assemble a microprocessor than it does a Boeing aircraft! In 1971 the revolutionary Intel microprocessor held 2300 transistors; today there are over 7.2 billion transistors in Intel’s Broadwell-EP Xeon microprocessor. The circuit line width in the original model was 10,000 nanometres (one billionth of a metre); today Intel are manufacturing 14 nanometre microprocessors, implying significantly more ‘brain power’. To put this in context, an average human hair is 100,000 nanometres wide. The scale and complexity of chip design requires specialised, tightly controlled manufacturing processes. And Intel is one of the few semiconductor companies who manufacture their own product rather than outsourcing the production to a foundry. The microprocessor chips are manufactured in a factory, or what is referred to in the industry as a ‘fab’. 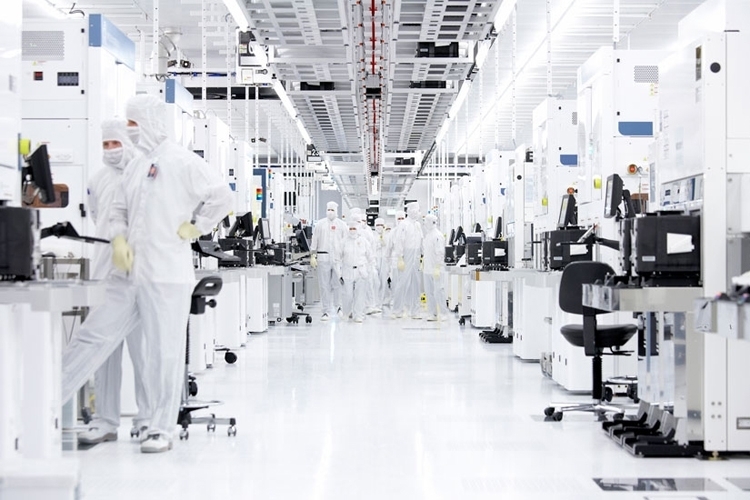 The Intel manufacturing fabs in the US, China, Ireland and Israel are a far cry from what one may imagine a factory floor to look like. The fabs themselves cost over US$8.5 billion to build and are state of the art facilities fitted out with machinery worth in the hundreds of millions. Before entering one of these fabs, often referred to as a clean room, technicians need to have cleaned their hands and face as make-up, perfume and other cosmetics are forbidden. They are then required to don what has been called a bunny suit to enter a pressurised room that sits between the outside world and the clean room. The suit covers the whole body and includes gloves, safety glasses and a mouthguard. The air in the clean room is what is called Class 10 purity, which means for every cubic foot of air there can be no more than 10 particles larger than half a micron, which is about the size of small bacteria. To put that in context, in a hospital operating room there can be as many as 10,000 bacteria size particles in a cubic foot of air, and in the outside world there are about 3 million. Manufacturing their own products provides Intel with the ability to optimise performance, reduce operating costs, shorten time to market, and enable them to scale new products quickly – a distinct advantage over competitors in the industry. Considering the vast intricacies and associated manufacturing costs for chip makers, can investors achieve a decent return from Intel? Our response is an emphatic “yes”. In 2016 the worldwide semiconductor market reached a record value of $334 billion. According to Gartner, an independent technology industry research firm, the industry is continuing to grow at a double-digit rate in 2017. This view was certainly reinforced by the semiconductor companies we met on our most recent research trip. Intel holds the number one share in the semiconductor market, a position it has held since 1992. Intel reported full year revenues for the last fiscal year of a record US$60 billion with gross margins above 60%. However, despite the impressive metrics and the strong underlying industry fundamentals, Intel’s share price has lagged the Philadelphia Stock Exchange Semiconductor Index (up by over 30% for the calendar year to date). More recently, Intel’s shares were trading on a 2018 price to earnings ratio of around 13x which is a discount of approximately 20% to the S&P500 market multiple. About 55% of Intel’s microprocessor revenues are PC related, where Intel commands a market share of over 80%. In 2016 global PC sales fell for the fifth consecutive year and continue to see declines in 2017 as consumers move to mobile devices such as laptops and smart-phones. The consensus view is that Intel are not only vulnerable to falling revenues in their PC division, but also margin declines as new competitors look to take market share. Interestingly however, despite declines in global PC sales, Intel managed to grow their PC-related revenues in 2016 by around 2% and sales continue to outpace broader market declines this year. Intel’s management are realists and they expect global PC sales to continue to crimp growth. Strategically they have identified ‘the cloud’ as the most important trend in shaping the future of technology. According to Intel, the cloud will enable a change in the relationship individuals have with technology, as appliances and devices become increasingly connected to each other. Product development is now increasingly focused on the strategic goal of transforming the business into one which is less reliant on growth from PC-related revenues and more leveraged to growth from the cloud. The significant amounts of computing power required for this industry transformation play to Intel’s strength. Technology innovation is embedded in the company’s DNA, as is the ethos echoed by former CEO, Andy Grove, that “only the paranoid survive”. Being the leader in revolutionary technology is the objective, hence the relatively high 20% of sales revenue spent on research and development. Growth in the data centre division, which best reflects their cloud strategy, has been in the high single digits in the last two years and accounted for around 30% of revenues in 2016. 2017 has seen a myriad of new product launches, primarily targeted at cloud customers. These new product launches along with the product pipeline are positioning Intel to be a leading supplier of chips not only in PCs, but extending to cloud applications, automotive and 5G communication industries. The market has been justifiably concerned about declines in PC business and a share price that is little changed in three years. In our view, Intel have done well to maintain PC revenues and margins amid the declining market and have concurrently been transforming the company from being PC-centric to a data-centric powerhouse. As shareholders, we understand this sort of transformation takes time and investment, and we do not think current share prices give credit to a company that is maintaining a meaningful PC business in challenging conditions, whilst at the same time positioning the broader business for long term growth. While this transformation progresses, we have seen the opportunity to buy the market leader in semiconductors at an attractive valuation with a thesis that is supported by evolving revenue sources. Considered together with a solid 3% dividend double the rate of its sector peers we are being paid to wait for the new revenue streams currently sitting deep within the sanctity of the fabs.